Once again, another DevWars match has come and gone. Did you miss it? Whether you did or not, I'm here to recap it for you! 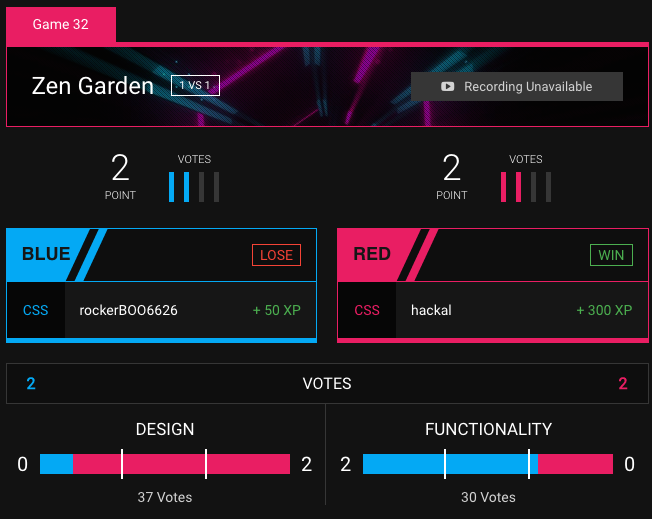 This week rockerBOO6626 (blue) went up against hackal (red). As usual, each of them used only CSS and a provided HTML page. This game was super close and ended in a tie. 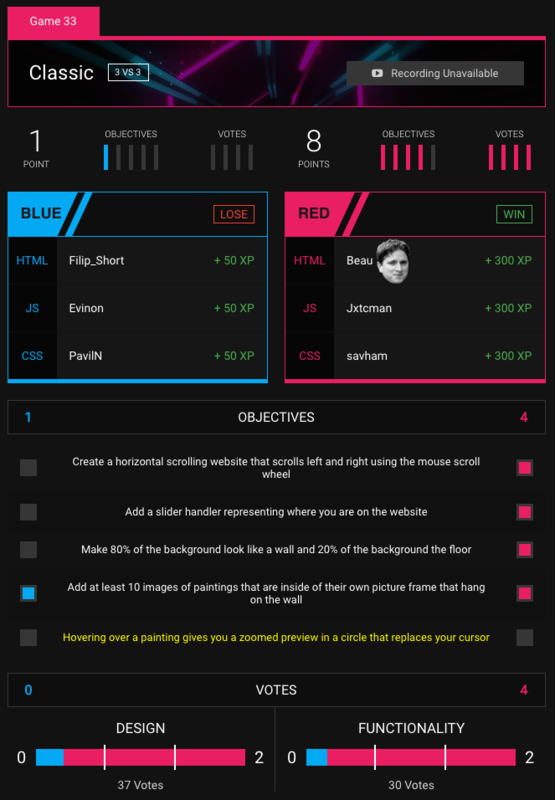 Even better, red annihilated the design vote while blue destroyed the functionality vote. It was pretty tense. Both sites looked great. Blue had a nice dark purple theme that felt very underground grunge. It was responsive and did what it needed to do. Red's look was much brighter and a bit more modern, but it was also responsive and worked well. This was definitely a good match for a tie, as both players demonstrated good use of CSS. For the classic game, we had Filip_Short, Evinon, and PavilN (blue) go up against Beau (our very own DevWars frontend magician), Jxtcman, and savham (red). Red did end up winning the game, but blue managed to complete one objective in spite of running into some difficulties. Blue seemed to have almost finished, but unfortunately not all of their paintings were visible. Red had a nice setup with a custom horizontal scroll system and nice frames around their paintings.